Let the adventure begin! With 350 of uncomplicated lower ecological bluesign ® certified material from leading outdoor nights are comfortable for the body and soul. 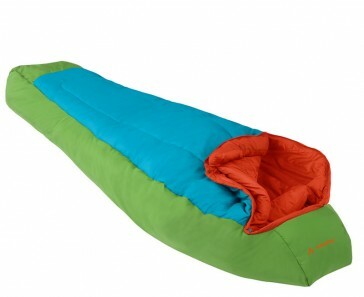 The "Starter" sleeping bag for children approximately 3-8 years max. 140 cm. The functional ECO synthetic fill Sensofil reflects body heat, has excellent absorption, breathable, making it a comfortable sleeping environment. Dreamer warm even when wet, is easy to clean, quick drying and easy to handle. A great bag for summer camp, Boy Scout camp or camping holiday with the family. Green Shape is VAUDE's quality label for products that have special ecological manufacturing. The criteria are strict: only products that consist of at least 90% cotton, recycled wood or fiber Tencel ®, stained with staining VAUDE eColour the environment or the world's most stringent textile standard bluesign ®, can lead to Form Green cachet.